We now have in the sky the magnificent Taurus (the Bull, ch. 8), with its red giant in the eye, ALDEBARAN (the one that remains in the centre). On the first day, at 11.0 pm, it is to be found at two and a half hands over Guijo de Galisteo. As we have been watching for several months, I’m going to make a parenthesis to remind you of the significance of all these statements. When I say “above Guijo de Galisteo”, for example, I don’t mean that someone who lives there would have ALDEBARAN overhead, but to imagine he is in Villasbuenas de Gata looking in the direction of his own village and place himself in a direct line which would lead from Villasbuenas to Guijo, meaning he would have to look slightly south west, and thus the same with all the other villages. The bull has its horn inside the Milky Way and in it stands out EL NATH (the extreme), at two and a half hands a little to the right of Santibáñez el Alto. In addition, Taurus has two of the best open stellar cumulus: the HYADES, near ALDEBARAN, forming a kind of “vee” a little over two and a half hands over Guijo de Coria; and the PLEYADES, also known as the SEVEN SISTERS, amongst which ALCYONE stands out (it’s the name of a bird), a little to the right of the former ones, but at three and a quarter hands. 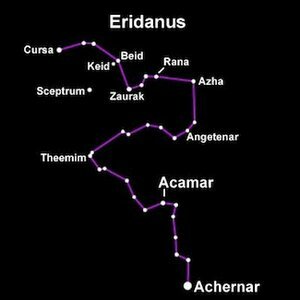 Underneath TAURUS flows one of the longest constellations, Eridanus (the River, ch.15), whose most brilliant star is not visible to us, as it is 60º south. But what we can see is CURSA (the chair of the Central), at one and a half hands between Guijo de Coria and Morcillo. And half way into the Río, the third nearest star visible to the naked eye, EPSILON-ERI, similar to our Sun, with a possible planet of which has been tried, without success, to listen to radio waves. It is a little less than two hands and a little to the left of Coria. 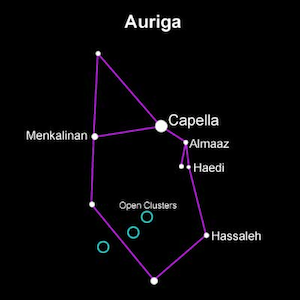 And we finish with the Auriga (the Cochero, ch.20), which has the third most brilliant star of our hemisphere, CAPELLA (little goat), a little less than three hands to the left of Torrecilla de los Ángeles. Nearby, but over Hernán Pérez, there is a little triangle formed by the CABRILLAS. Finally for today, MENKALINAN, (the Cochero’s shoulder), in the same direction as Capella, but at two and a half hands. And until next year, hoping it will be a happy one and with more justice!